The Nile Basin Development Challenge (NBDC) has identified several challenges to effective planning and implementation of rainwater management (RWM) interventions in its three sites, (Jeldu, Diga and Fogera) located in the Blue Nile Basin of Ethiopia. Challenges include poor coordination and communication between actors, lack of bottom-up planning and insufficient community participation. Local level innovation platforms have been established in each site an attempt to work with a range of stakeholders to address these issues. So far, innovation platform members have identified common RWM issues and have designed pilot interventions at a micro catchment scale. However, we need to draw on the lessons learned to design more effective strategies at a larger scale. 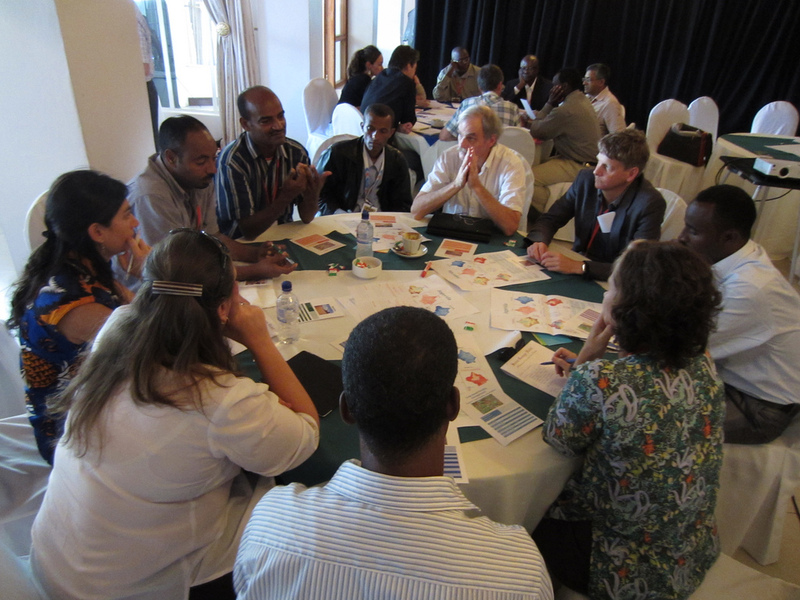 In December 2012, researchers from AfroMaison and the Nile Basin Development Challenge co-organized a workshop in Fogera to develop landscape scale strategies for improved rainwater management. 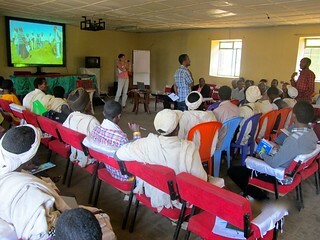 The workshop was organized by Mulugeta Lemenih, Beth Cullen, Zelalem Lema and Aberra Adie with assistance from Geraldine Abrami and Emeline Hassenforder. The aim of the workshop was to use WAT-A-GAME (WAG), a participatory planning tool, as the starting point for looking at RWM issues at a landscape scale. WAT-A-GAME is an open toolkit developed by IRSTEA and CIRAD which enables participants to design and run simulations for water management, policy design and education. It aims to show how water moves within a landscape, how it is used, polluted, transformed and shared by actors. Using WAG, participants can simulate various actions or strategies and the resulting impact on their household economy, their wellbeing, labor, and the surrounding ecosystem. New policies can also be invented and tested. It can be adapted to individual cases, various land and water management issues and different scales. WAG has been designed to be used by a range of stakeholders, including farmers, scientists, experts, administrators and policy makers. In this workshop WAG was used to model the Fogera catchment and simulate key RWM issues including water availability, run-off, soil erosion and the impact of different land-use practices. Research conducted by NBDC scientists has highlighted a disconnect between farmers and decision makers in terms of perceptions about NRM problems and ideas for solutions. This is exacerbated by a lack of communication and understanding between the different actors. In order to highlight these differences participants were separated into two groups of 28 community representatives and 22 decision makers and experts. For the first two days these groups worked separately to identify and prioritize key issues, identify technical, institutional and policy interventions to address these issues and to incorporate these actions into an integrated strategy. On the third day, the two groups presented their strategies to one another. This led to knowledge sharing and constructive dialogue about similarities and differences between the strategies, the reasons for this and how they can be merged. The role-playing exercises and subsequent discussions raised awareness about upstream and downstream linkages and landscape interconnectedness. Regional and district staff learned about farmers’ knowledge and priorities, and vice versa. This was the first in a series of workshops, the next step will be to test strategies developed during the first workshop and work with stakeholders to create an integrated and feasible strategy for the Fogera area that can potentially be implemented. It is hoped that this process will be replicated in the two other NBDC sites over the coming year. The process will be used to share experiences and knowledge between the three sites, as well as between local and national platforms in an attempt to inform policy. Best practices for rainwater management in the Ethiopian Blue Nile are well known. They include many practices related to crop livestock and trees that increase water availability or productivity within the watersheds, such as soil and water conservation, small scale irrigation, fertility management, or livestock management. Nonetheless, adoption of many of these practices is still low, mainly because they have been promoted in locations where they are not suitable, or have not been combined with symbiotic practices that would result into real benefits for farmers. Rainwater management practices therefore need to be combined at landscape scale to form rainwater management strategies. These strategies fit a specific context that is defined by the bio-physical, socio-economic and institutional constraints. In other terms, best bet rainwater management strategies are location-specific and best practices should be combined differently in different locations. For the Nile basin, adoption maps were created, based on economic models. These show the percentage of farmers that are predicted to adopt a practice, given the socio-economic and institutional constraints. When the suitability maps are overlaid with adoption maps, a feasibility map is created that shows how many farmers will likely adopt the technology on a suitable location allowing to prioritize locations with suitable socio-economic conditions. The Nile Goblet tool (also presented here) is an open source GIS tool that allows easily to make suitability and feasibility maps without prior GIS knowledge. It is a very flexible tool that in principle allows to map any practice for any location of the world, and helps consider combinations of practices. A database has been developed which includes all the (freely) available layers for the Nile basin, as well as the suitability thresholds suggested by the “integrated participatory watershed management guidelines” from the Ministry of Water and Energy. The maps resulting from the tool can be very inaccurate, due to the scale and inaccuracy of the input data. As such the maps present windows of opportunities based on expert knowledge of what communities could do. Action on the ground should help unlock local knowledge and complete this picture. Implementation should therefore be done in a participatory manner for instance with approaches such as the ‘happy strategies’ game. It can enable a dialogue between communities, non-governmental organizations and local government agencies around rainwater management practices, so as to validate the maps and come up with a feasible plan on the ground. Offering a tool that allows policy-makers and practitioners to introduce their own or expert knowledge about suitability criteria into a transparent procedure will help them understand and trust the resulting maps, better understand why promotion of rainwater management should be location-specific and move away from today’s blanket approaches. Indeed, the resulting maps can support the elaboration of context-specific policies. 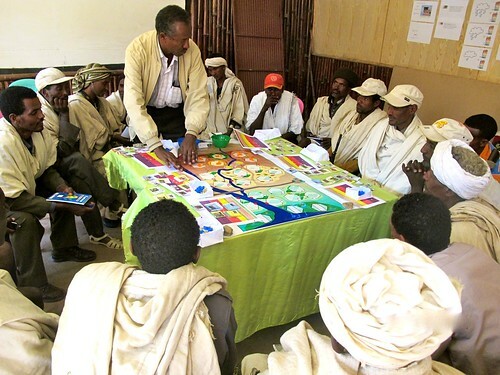 In combination with the happy strategies game, the maps also enable expert knowledge to blend into a participatory approach and improve the planning on the ground with communities. One project of the Nile Basin Development Challenge aims to match land and water ‘practices’ and interventions to the needs of specific landscapes. In 2011, we experimented with a game – modeled on the ‘happy families’ childrens’ game – to discuss the challenges involved. In this video, Alan Duncan (ILRI) and other game members explain the results of a game played at the 3rd International Forum on Water and Food in November 2011. While the landscape used was fictional, the story gives ‘real-life’ insights into rainwater management challenges and opportunities in Africa. The game used a fictional landscape derived from real NBDC sites in Ethiopia – the landscape background and game objectives are described in this presentation. There is nothing as practical as a good theory. And there is nothing as strategic as a game one might say, judging from the interest that the ‘happy strategies’ game generates among serious researchers. Not surprising perhaps, since the game holds a lot of value to understand the strategic issues behind effective land and water management. And it does so in a playful way. During the Share Fair organized around the International Forum for Water and Food, the ‘happy strategies’ game was introduced to a group of about 20 participants. In the two-hour session, the participants learned all about the process of the game: First, the group discovers the imaginary site where the action of the game is taking place (through its altitude, slope, rainfall etc.). Second, all participants around the table receive (rainwater management) practice cards indicating the purpose and suitability of that practice for different types of landscapes. b) An effective strategy comprises a complex set of interventions that are tailored to each specific location but also interconnected in some way. In the game, there are basically three levels of intervention: The highlands, midlands, lowlands. Perhaps this geophysical set up is informed by the topography of Ethiopia, where the game was created. Where the power of the game really reveals itself is in the discussions that participants have around the most effective interventions. Looking at the cards they received, the groups discuss the potential of a certain intervention or practice over another, and if they are not happy with the set of cards they have, they can trade some at the central practice bank. They may also come up with innovation cards – on new practices – which they develop as a group during the game. Discussing the pros and cons of each intervention for each level itself sheds light on the benefits of each approach and its potential to be embedded in and reinforce the whole strategy. The arguments and discussions leading to select strategies effectively unveil a picture that is bigger than the sum of the parts. At the end of the phase, after about an hour and a half, participants introduce their collective strategy to one another. It is possible to spend additional time to cross-review and assess these strategies. This process reveals additional issues and factors that might justify the strategy or shape the understanding of how different practices and interventions make sense together or not. The game has a lot of potential to generate common understanding around food and water issues, harness collective thinking and devise more effective strategies for water and food interventions. The rich discussions triggered by the game bear the promises of revealing new interventions and practices. Expert inputs can therefore broaden the understanding be put directly into practice in the game (as new intervention cards at the next iteration of the game). We also think it might be something we can take to local communities – for them to identity and discuss different practices and strategies, with each other and with experts. 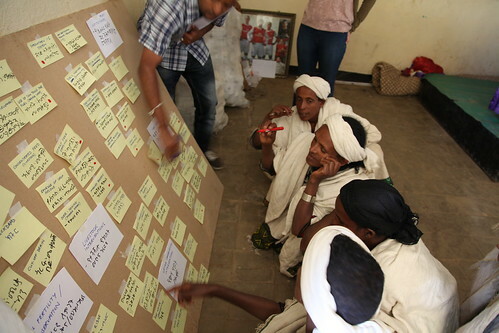 It was only the second time that the ‘happy strategies’ game was played (it was first played in Bahir Dar in October 2011) and some tweaking is still required: The fictitious site was too closely molded on an Ethiopian landscape and the set of interventions was therefore adapted to that environment. For people unacquainted with Ethiopia, engaging proved challenging and their ideas of strategies and interventions differed substantially. That said, the simple and entertaining exercise that the game offers – to work on otherwise very complex issues – is worth exploring further and for once the result matters less than the discussion process. Mae West wouldn’t have put it otherwise.